Here are the ins and outs you need to know to make the best decision this year for you and your family. 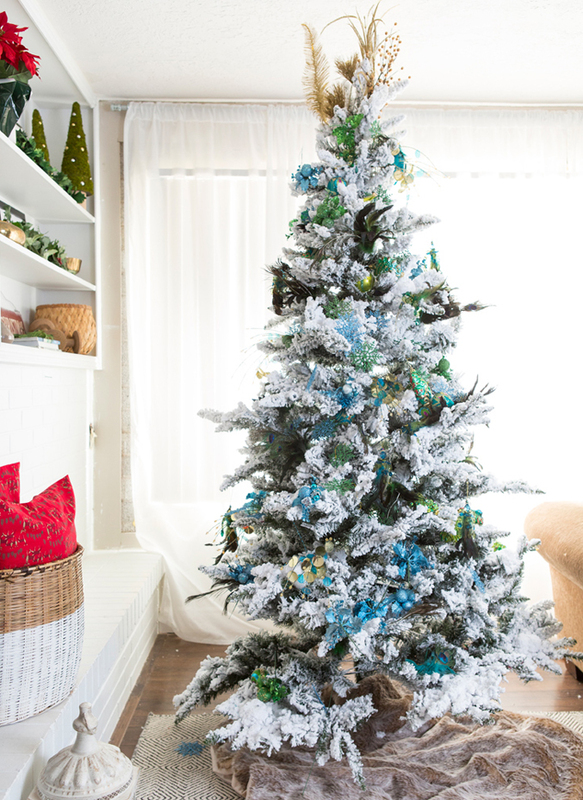 Blogger Shonee Smith of Hawthorne and Main chose flocked branches for a wintery ambiance. Once decorated with lights, ornaments and other accents, it can be difficult to tell by sight whether a tree is real or fake. Live trees can be a pain to bring home, get through the front door and set up. Faux trees, however, are convenient to set up. They usually come in sections that are easy to assemble, and you can often get pre-lit models that save you from untangling all those lights every year. If you don’t have much storage space, though, you may want to go with a live tree, as you’ll have to store a faux tree for the other 11 months of the year. A high-quality faux tree can be expensive, ranging from a few hundred to a few thousand dollars. You’ll spend less on a live tree, only $100–$200, but over the years, those $100 purchases will add up. Most artificial trees last 5–7 years, so depending on the quality of the artificial tree, live trees may still be more cost effective in the long run. Real trees are messy as they die and drop their needles, a problem you won’t have with a faux tree. Artificial tree don’t shed or require maintenance. The smell is also a consideration—if you get sniffles every year when you bring in a real tree, you may be allergic to pines. On the other hand, a real tree brings that heavenly pine scent that faux trees lack. It seems like cutting down thousands of evergreens each year would be bad for the environment, but many argue the opposite. Faux trees contain synthetic materials that have a higher environmental footprint than live trees. Also, because of the demand for Christmas trees, the US has approximately 350 million Christmas trees growing on tree farms, which provides additional habitats for animals and agricultural growth in the US. Victoria Van Vlear is the editor for American Farmhouse Style Magazine, where this article was originally published. For more home-grown inspiration, follow on Facebook and Instagram.